These ecoregions of Central and South America were developed in 1998 as part of an effort by the US Geological Survey EROS Data Center and U.S. EPA NHEERL-WED to develop a first approximation of ecological regions for the Western Hemisphere (North, Central, and South America), and that would be relatively consistent with the already completed North American ecoregion framework (CEC 1997). The 1998 project report "Ecological Classification of the Western Hemisphere" (Griffith et al., 1998) discusses some of the philosophical and methodological differences used in the development of ecosystem frameworks and how these differences can affect regional identification and boundary delineations. 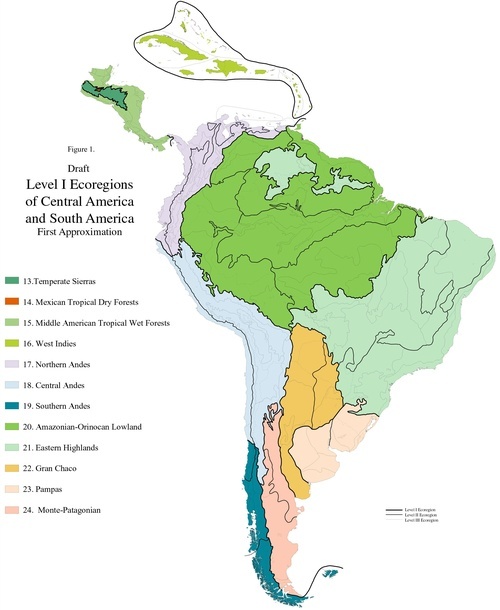 The aim of the report was to review ecological classifications of North and South America; highlight the differences in their objectives, approaches, and results; discuss some problems encountered in multi-national mapping efforts; and to present a preliminary alternative classification for Central and South America. 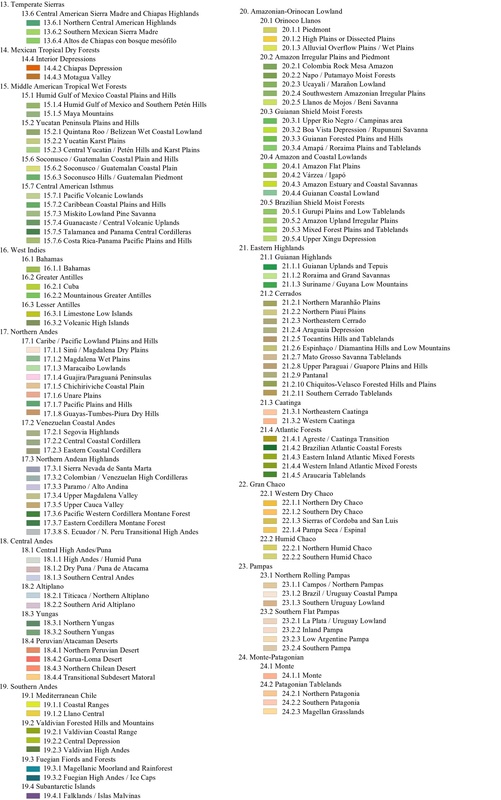 The initial delineation of ecoregions was based on analysis of multiple types and scales of thematic maps including geology, physiography, soils, potential and existing vegetation, climate, landcover and agricultural uses, other ecological frameworks, and from other regional descriptive documents. For Central and South America and the Caribbean, we delineated 12 Level I regions, 35 Level II regions, and 121 Level III regions. Boundaries for the Central and South American ecoregions were delineated and digitized on 1:5,000,000-scale base maps and should be considered as approximations. Working at this more general scale is in contrast to the ecoregion mapping completed in the U.S. at the more detailed 1:250,000 scale (Omernik and Griffith 2014). 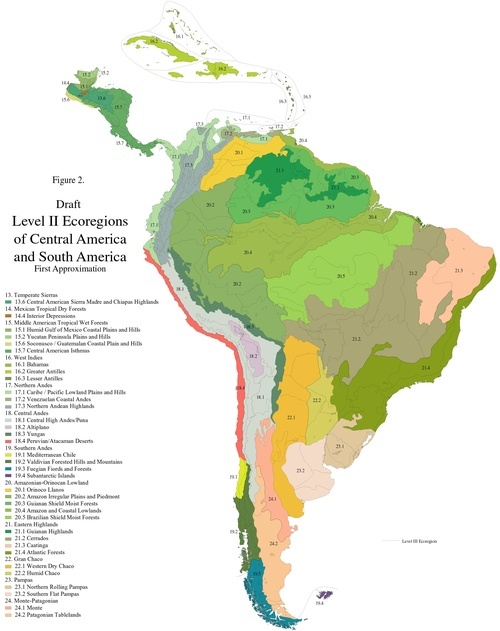 Although a more formal and detailed effort to map Central and South American ecoregions was not pursued by the USGS and US EPA, we provide this draft work for those interested in the concept and uses of a general Western Hemisphere regional framework (e.g., Lawler et al., 2009). Commission for Environmental Cooperation. 1997. Ecological regions of North America: toward a common perspective. Commission for Environmental Cooperation, Montreal, Quebec, Canada. 71p. (map updated 2006). Griffith, G.E., J.M. Omernik, and S.H. Azevedo. 1998. Ecological classification of the Western Hemisphere. Unpublished report. U.S. Environmental Protection Agency, Western Ecology Division, Corvallis, OR. 49p. Lawler, J.J, S.L. Shafer, D. White, P. Kareiva, E.P. Maurer, A. Blaustein, and P.J. Bartlein. 2009. Projected climate-induced faunal change in the Western Hemisphere. Ecology 90(3):588-597. PRINCIPAL AUTHORS: Glenn E. Griffith, James M. Omernik, and Sandra H. Azevedo.